Yesterday was just the *best* day. If anyone knows anyone really high up when it comes to government holiday making & calendar printing I wouldn't be opposed to you suggesting that every weekend should last three days. I was in the best mood and had the most stress free Monday and could really use more of that and the relaxation it provided in my life. Although, with the relaxation came a little bit of a cold that I have been downing emergen-c to try to combat it! I think the groundhog may have gotten it wrong when he claimed that we were going to have six more weeks of winter (come on, Phil). 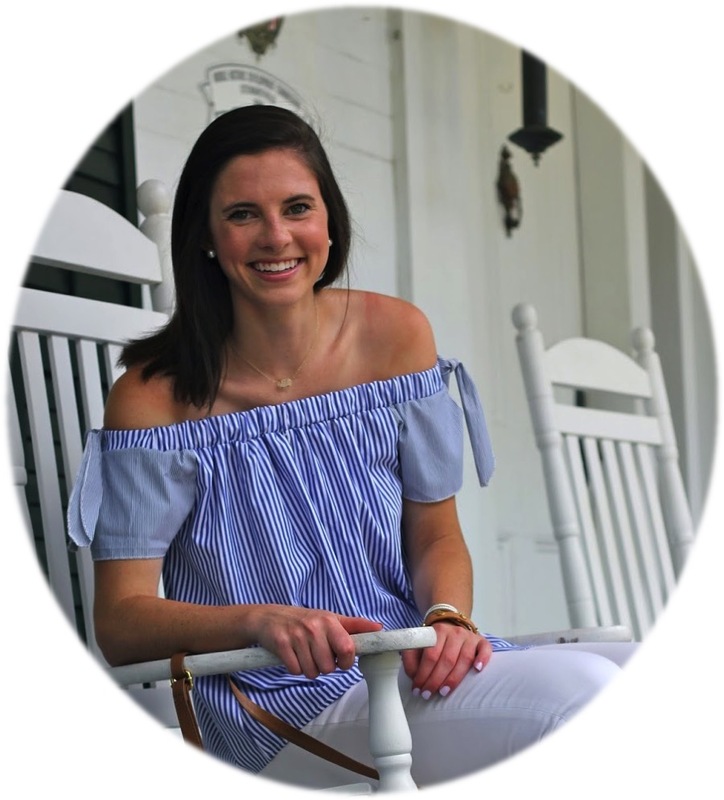 It is supposed to be in the seventies this week which means deciding on outfits when it comes to student teaching may be even harder than usual. Let's just hope the weather stays this warm since Spring Break is only 2 weeks away and I'd prefer not to have a sudden cold snap! Usually I am quite the rule follower in every aspect of my life but realizing the added outfit options possible in my closet by wearing white jeans in the winter has caused me to become a bit rebellious in this sense. As February continues on I find myself constantly wearing dark pants and grey sweaters which can be kind of sad since in my world that is lacking a lot of color. 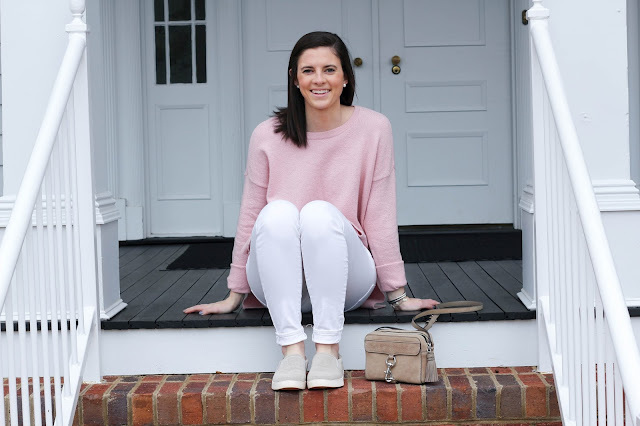 White jeans have become the perfect alternative and when paired with a nearly neutral blush I've come to realize just how much color can affect my mood. 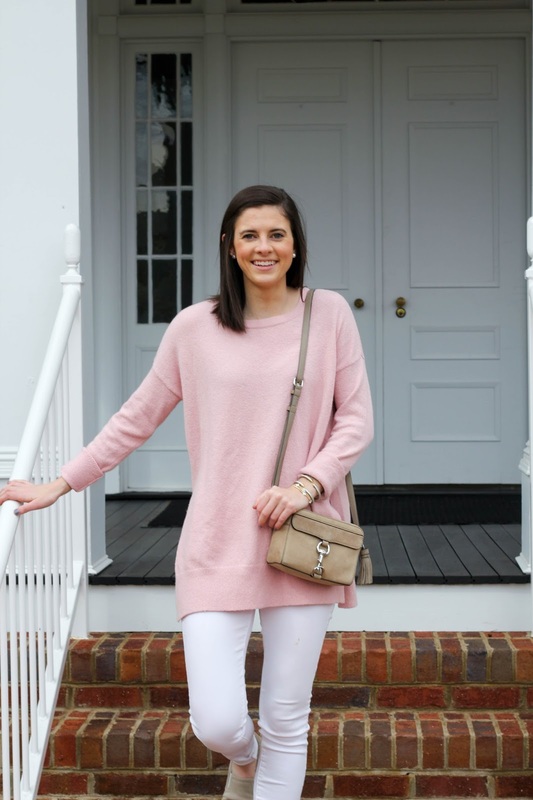 This is the type of outfit that makes moderate February days feel a bit less dreary and more welcoming of spring! 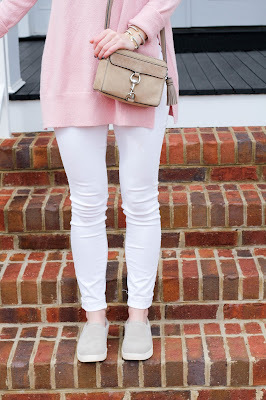 These white jeans are my absolute favorite and are a staple for the whole year at under $60. The white color is crisp and the fit is flattering without being too skinny or suffocating. 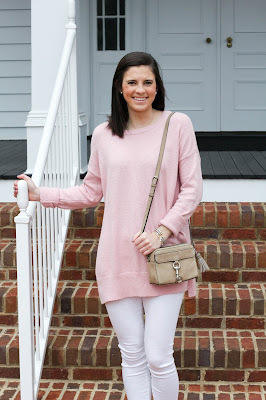 I've had this blush sweater in my closet for a while now and had yet to find the perfect way to wear it. After seeing numerous bloggers style blush all year round I figured that I would give it a go. I now know that this will be an easy to reach for outfit when I want to look put together yet feel completely comfortable. I'm also pretty positive that 2017 is going to be the year of slip on shoes because this pair from Dr. Scholls takes the cake when it comes to comfort and adds a slight cool factor when it comes to any outfit. 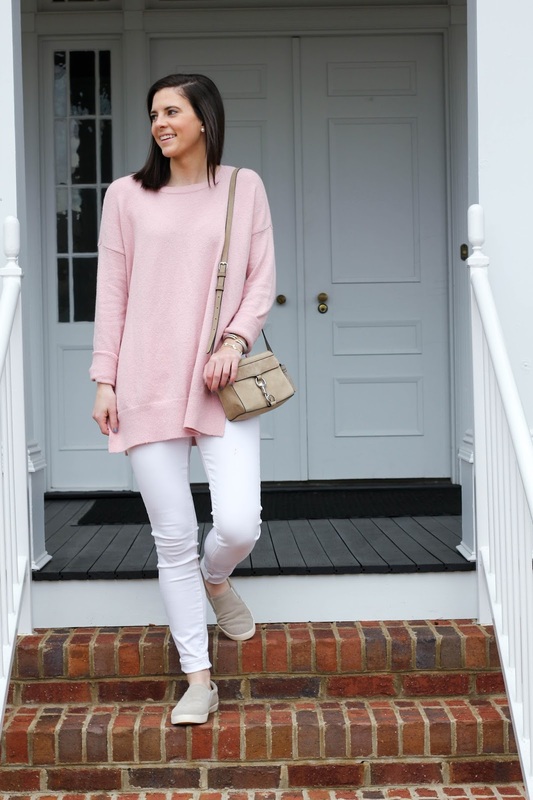 While I am certainly hoping to be able to wear all of my spring clothes soon discovering the versatility of white jeans in the winter will hopefully make dressing for the season slightly more bearable! 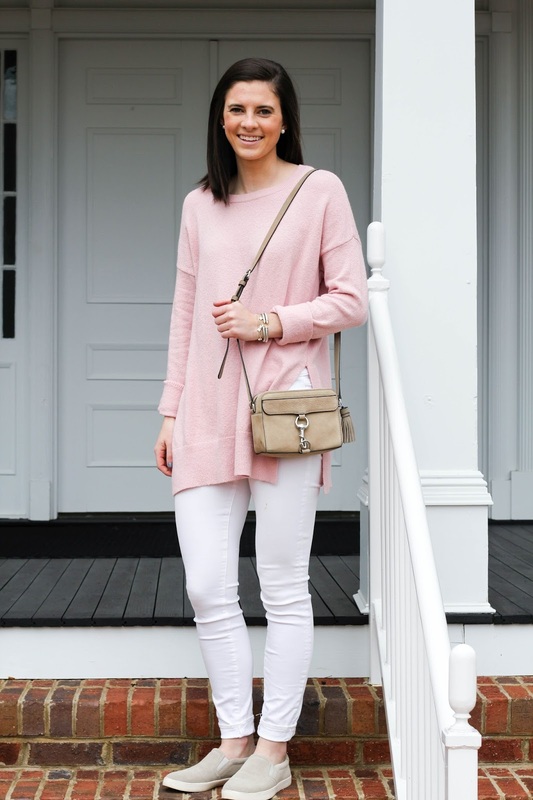 A blush top with white bottoms are one of my favourite and go to colour combinations. Love the simplicity of your outfit! As a teacher, I'm in full agreement about the long weekends! The person who made our school calendar gave us Friday off as well and it was the perfect treat! Love this look! Classy and put together, but also comfortable. would love to see you mix it up on here!